My wedding day was exactly three weeks before my last year in college. We were both taking a full load of classes, and our sole income was my husband’s blossoming music career. This meant our first year of married life included a rigid schedule of schoolwork during the week and out-of-town concerts on the weekends. (We actually traveled to Australia and back over the weekend in that first year to be able to make it back to class on time. Yes, you read that right, over one weekend.) We formed many good memories that year, but it was exhausting! As graduation drew near, we created a countdown. We were filled with hope about the relief of classes ending and schedules freeing up. No longer would we be trying to study for finals while managing a small business and traveling around the country. We’d be able to fully devote ourselves to the music ministry God was setting before us. And we couldn’t wait! We created a countdown because our hope for the upcoming season was secure. We didn’t wonder if we would be done with the season of college. It was only a matter of time. One day soon, we’d walk the stage, get our diplomas, and find many hours freed up from study and class. It was a secure hope. But hope, by definition, is a longing for something not yet realized. And so we waited. We excitedly marked off each day. 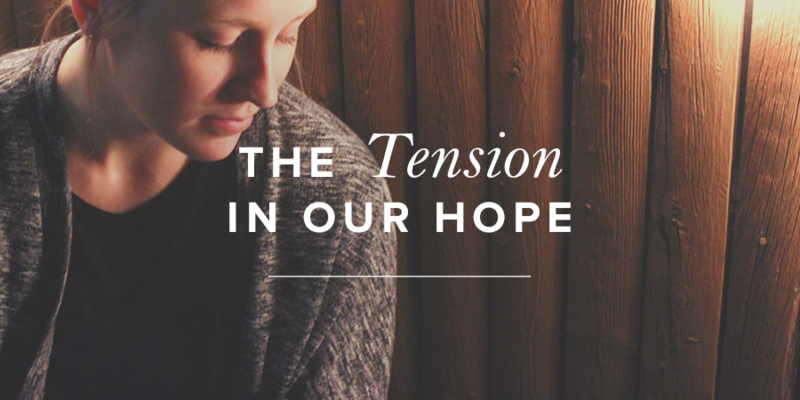 We endured the tension of what was and what we longed for because our hope was sure. As Christians, we have something much better than a college graduation to look forward to. Our future is entirely secure and promises more joy than we can possibly conceive of. It’s actually true that God of the universe is our Father! One day, He will remove forever all our sin, suffering, and pain. He will usher us into perfect and unhindered friendship and community with Himself and all those who love and trust Him. What a hope we have! But hope creates tension. It inserts a longing for a future reality that is totally secure but not yet accessible. Our hope is not yet realized. As I write these words, I’m very aware of my sinful tendencies and the lingering flesh still inside me. I’m suffering in fractured relationships and unfulfilled longings. I don’t always feel the nearness of God in the way I would like. And so to believe what is true, to hope in what is promised, creates a tension in my life. Tension between what is and what I am promised as a daughter of God. This tension is not a pleasant thing, but it’s also not a bad thing. It’s the normal experience for Christians to live in this hopeful tension. So, don’t reject hope because it carries tension with it. Don’t reject hope because it doesn’t immediately solve all the unpleasant experiences in your life. This is “the hope to which [God] has called you” (Eph 1:18). How Do We Relieve the Tension? Tension always begs to be relieved. So, what should we do with the tension hope creates? Is there an action we can take? Something we can do to relieve the pressure? Yes! There is something we can do: wait. Not the action step you were hoping for, is it? Who likes waiting? But this connection between hope and waiting is a strong one. It is so closely linked in the Bible that these concepts, at times, are interchangeable. “And now, O Lord, for what do I wait? My hope is in you” (Ps. 39:7). “For God alone, O my soul, wait in silence, for my hope is from him” (Ps. 62:5). “For in this hope we were saved. Now hope that is seen is not hope. For who hopes for what he sees? But if we hope for what we do not see, we wait for it with patience” (Rom. 8:24–25). “For the grace of God has appeared, bringing salvation for all people, training us to renounce ungodliness and worldly passions, and to live self-controlled, upright, and godly lives in the present age, waiting for our blessed hope, the appearing of the glory of our great God and Savior Jesus Christ” (Titus 2:11–13). “For through the Spirit, by faith, we ourselves eagerly wait for the hope of righteousness” (Gal. 5:5). Our hope should lead us into waiting. But contrary to how we perceive it, waiting is not passive. Wait is a verb. It is something we do. It’s active. It takes energy and endurance to wait well. So, what does it look like to “wait for our blessed hope”? Waiting is a conscious choice to persist in seeking God, not a subconscious existing between prayer requests. It is continuous and active looking to God as the answer to all problems and unfulfilled longings. It is the fight to continually refocus our hope on God alone. It is constantly reminding our souls that He is trustworthy, He is reliable, and He will come through. Waiting on God is crucial when prayers remain unanswered and God seems distant, and it is necessary in fruitful seasons to remind us our hope is not in present success but future glory. Waiting on God is how we express our hope in Him. It’s the fruit of the tension we feel from the already and not yet of our faith. We wait for what we hope in. But remember, people only wait on what they know will come through. There's a reason no one is standing in line at an empty register at Walmart, hoping for a cashier to magically appear. There's a reason no one is sitting at a Chick-fil-A drive-through on Sunday, waiting to place their order. No one is coming, so waiting is pointless. We only wait on what is reliable. And this hope we have is infinitely reliable. It’s trustworthy. It’s sure. So, wait on it. I wait for the LORD, my soul waits, and in his word I hope; my soul waits for the LORD more than the watchmen for the morning, more than the watchmen for the morning. O Israel, hope in the LORD! For with the LORD there is steadfast love, and with him is plentiful redemption. And he will redeem Israel from all his iniquities (Ps. 130:5–8).